#TheCrews . Is This Scotland’s Answer To #TheSopranos ? I first met screenwriter Kolin Ferguson on a rainy Sunday in East Kilbride about three years ago.We were working on a short film by Write Camera Action Director Linda Campbell called “Stub It Out”. I was acting, and Kolin was holding a mike boom on what could loosely be described as a “Geurrilla Shoot”. In other words there were three of us! He told me that he was no sound assistant, but was a screenwriter, and was developing a 12 part TV Series about Glasgow Gangsters called “The Crews”. Not only was he going to write it, he was going to shoot it, with little or no budget. Along with Director Colin Ross Smith, and actors Jim Sweeney and Robert Harrison, they had the revolutionary notion that if they actually shot the first two episodes, then they would be able to raise the cash to finish the project. The whole thing was to be shot in HD, with broadcast quality sound. Oh and they were going to nip over to Amsterdam for a couple of days to shoot there too. I nodded and smiled benignly . I admired their chutzpah, but doubted their ability to carry it off. 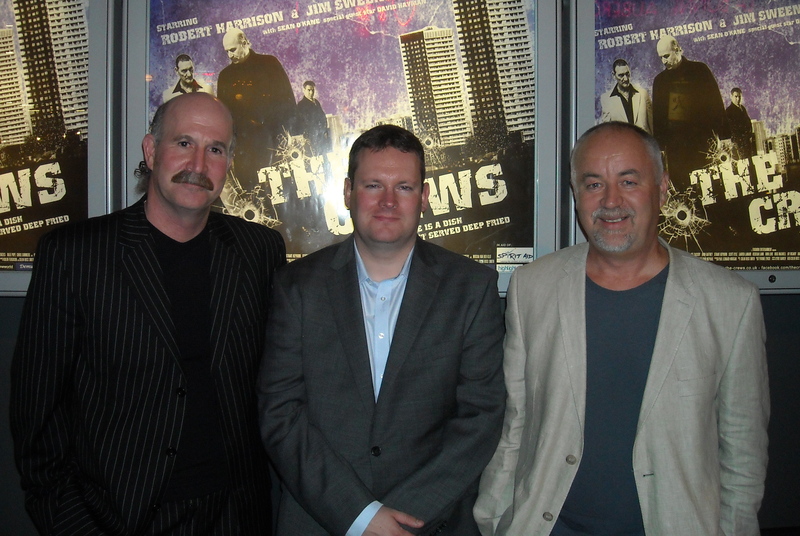 Nevertheless, later that year, Kolin and Colin came down to talk to our students on the Performance Programme at UWS and we watched their short film Sandwich, which also introduced me to their hatchet-faced co-star, Robert Harrison. I asked them how “The Crews” was going, and they told me they were going ahead with the plan. They had bought an HD camera, and it was all systems go. They thought it might take them six months. “But’, I said patronisingly, “NOBODY does it that way. It costs too much time and energy to do that. What you have to do is write the first episode, complete a one page synopsis, and punt it round the broadcasters. That’s what EVERYBODY does”. “We’re not everybody” they said, and ignored me. I am glad they did, because these brave, creative innovators have at a stroke, re-written the text book on TV Script Development. I know this because on Tuesday night, a full two years after our conversation at the UWS, I sat with an enraptured audience at Cineworld in Glasgow and watched the completed first two episodes. All proceeds from the 300 tickets (sold out) were going to Spiritaid, and I was happy to be there for the good cause. Because of the way in which The Crews had been developed, I had prepared myself to be in turns embarrassed, bored or even mildly impressed. What I was not prepared for was to be completely blown away by the whole event. “The Crews” rocks! Using complex techniques such as fractured narrative, flashback within flashback, and a bewildering multiprotagonist storyline,” The Crews” is ambitious, demanding and unsettling TV. Its the sort of thing we normally see on HBO or AMC. 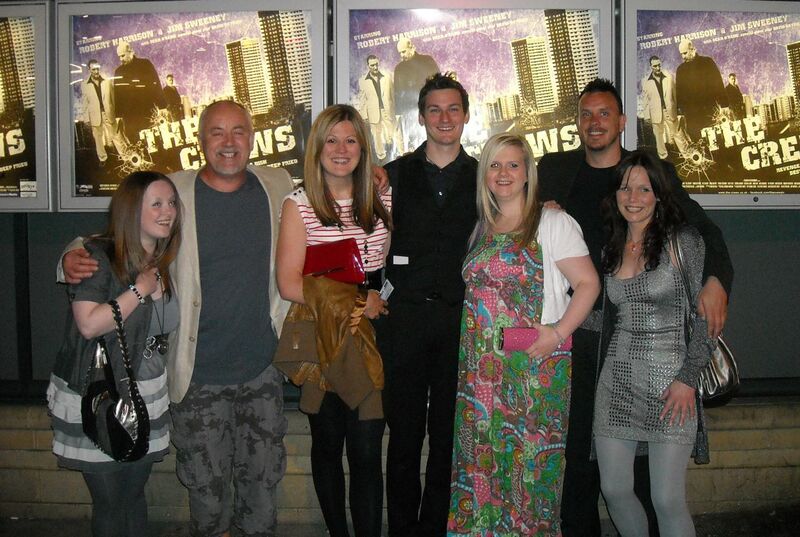 “The Crews” is tailor made for BBC4 or Channel 4. It’s the sort of show which unfolds at glacial pace and with the cadence and authenticity of work such as Simon’s “The Wire” ( 2002) and Scheuring’s ” Prison Break” (2005). The joint creator’s bill “The Crews” as “The Glasgow Sopranos” , but for me, it has more in common with David Simon’s televisual masterpiece from Baltimore. You thought Omar Little was nuts? Wait till you meet Stevie Turner. Whatever it’s worthy progenitors, while it’s Glasgow through and through, what makes “The Crews” unique is that to my uncertain knowledge, no one in the UK has ever done anything on this scale before . It’s no exaggeration to say that if this makes it to the small screen, this impressive product out of Dennistoun by East Kilbride and Ayr could prove to be one of the most important developments in the history of British Television making, and you can quote me on that. At the moment, the finished DVDs are with the BBC, and STV, and the guys are planning to take on the States at some point in the future, to see if funding can be attached. I am a writer and actor and no expert on the distribution side of things, but it seems to me that they need a selling agent or exec producer to convince a broadcaster to come up with the development and production money. They have personally spent more money than they can afford to get this far, and when I look at the standard of some of the stuff on TV at the moment , and think of “The Crews”, there is no justice if it doesn’t get made and seen by a wider audience. Kolin has the detailed plans for the rest of Season one, and , wait for it, has sketched out a full five season 60 Episode Arc. Caveat Emptor! I can’t enthuse too much about this as I am a cast member too . The silver-tongued KColins managed to cast me in a small role. (In fact, the banner above is a still from ” The Crews” taken by the Show’s make up artist, Yvonne Lynch. Yes, it was that sort of shoot!) On top of my cameo as DCS Watt, about 10 of our Performance BA Students were involved in the project, with special mention to great performances from Martin Haddow and Suzanne Morrison, and if you look very carefully you will see that quite a few of the locations were shot at our UWS Ayr Campus. Does this make it sound like some sort of an amateur profit share film? Possibly, but the proof of the pudding is in the eating. “The Crews” is professional in all but name, take it from me. David Hayman’s another cameo player in the mix, and he shares my opinion that this work must be seen by a wider audience, and all the professional actors involved are of the same mind. The point is, will the industry listen? My hunch is that middle of the road TV exec types will probably look on “The Crews” with mistrust . Why? Because this is a done deal. The talent is in place, the roles cast, the director decided, the first two episode shot and edited. Conventional Producers and Broadcasters( in Britain at least) tend to defend and implement their right to make major creative decisions over the heads of the real creatives at the cliff face. Will any of them have the stomach to put their money and reputation into something as left field as this which has been created by a bunch of virtual unknowns from Glasgow? Only time will tell, but I for one won’t bet against Colin and Kolin making it against all odds. All it will take is one broadcaster or commissioning editor, one cable company or distributor with enough courage to back them. You can get an idea of the show from this interview on” The Culture Show” , if you go to 17 mins and 15 Secs , or have a look at this trailer on Youtube. If anyone deserves a break, it’s the KColins and all those who backed them from the start. If you want to support them, please forward this blog to anyone you think may be able to help get this on screen. It is amazing to see what can be achieved on a minimal budget. Hopefully these guys will find funding for future projects. It was a great night, and some of the performances were a standout. I thought that David Hayman’s speech was powerful and certainly made the audience think about the realities of our Governments actions. Probably similar to your own comments on these pages about mistrust and alarm from “the industry”. I believe that its a case of, “it’s our ball, and you can only play if we say so”. Well done on a good performance from yourself, Stuart. I have fingers crossed for the guys. Thanks for your support.